Patients with hemimegalencephaly (HME), a disorder of abnormal and excessive cell proliferation during cortical development, usually present with refractory epilepsy, global developmental delay, mental retardation, hemiparesis, hemianopia, and learning disorder. Among hyperkinetic movement disorders, hemimyoclonus has rarely been reported in world literature. Here, we are reporting a rare case of hemimyoclonus in a young boy with developmental delay, who was subsequently found to have HME. The associated neurocutaneous marker in our case was nevus depigmentosus contralateral to the side of HME. A 17-year old boy, born of a nonconsanguineous marriage, with uneventful perinatal history but with delayed motor and cognitive development, was symptom-free up to 6 months of age. Then, he started having recurrent generalized tonic–clonic seizures that persisted for up to 1 year. After that, he started having persistent jerky movement of his right-sided limbs. They used to present both during rest and activity but were absent during sleep. On examination, no tactile or auditory sensitivity was found for this involuntary arrhythmic, jerky, non-suppressible movements. A hypopigmented patch with intact sensation was found over the right side of his face that was present since birth, suggesting the presence of nevus depigmentosus [Figure 1]. His right upper and lower limbs were weak (power of grade 4/5 on the Medical Research Council grading) in comparison to the presence of a normal power on the left side. Pyramidal signs in the form of spasticity, equivocal planter response, and brisk stretch reflexes were noted on the right side only. Cerebellar signs were absent. The phenomenology of the abnormal movement was suggesting the presence of myoclonus but was involving one-sided limbs only [Video 1]. As the involuntary movements were completely absent during sleep, the presence of epilepsia partialis continua (EPC) was unlikely. The complete hemogram, as well as the renal, and liver function tests were normal. We opted for double channel electromyography (EMG), one from right extensor digitorum communis (EDC) and the other from right deltoid, that showed (1) burst duration of less than 50 ms, (2) propagation speed of approximately 30 m/s, well above that of the propiospinal pathway (that is usually in the range of 5–6 m/s), both indicating the cortical origin of the myoclonus [Figure 2]. Electroencephalography (EEG) revealed asymmetrically higher background amplitude on the left side in comparison to the right, and irregular spikes coming from the left side, which also indicated the cortical origin of the myoclonus [Figure 3]. 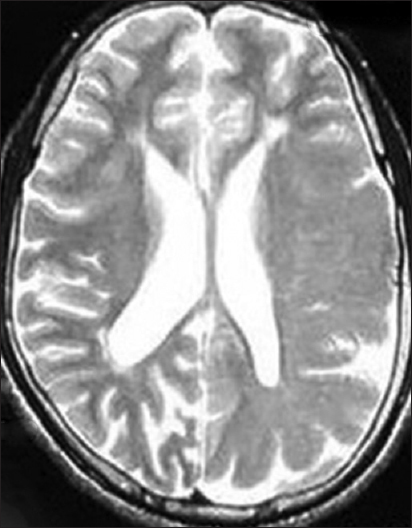 Magnetic resonance imaging (MRI) of the brain revealed left-sided HME [Figure 4] and [Figure 5]. A diagnosis of cortical origin hemimyoclonus was made, and the patient was treated with sodium valproate and clonazepam. We searched for any systemic signs such as associated limb hypertrophy, well-reported with associated HME, but only found bifid distal phalanx of the right little finger and exotropia of the right eye. On follow-up visit at 3 months, his myoclonic jerks had decreased in frequency. While hemichorea, hemidystonia, and hemiballismus are well-known entities, hemimyoclonus is rarely mentioned in the literature. Moreira et al., reported the case of a young man with hemimyoclonus on the right side after cerebral hypoxia caused by an injury in his left common carotid artery (unilateral Lance–Adams syndrome). Martijn et al., described a unilateral (right-sided) reticular reflex type of brainstem myoclonus resulting from the dolichoectasia of left vertebral artery compressing the lower brainstem. Others have reported hemimyoclonic jerks as the manifestation of EPC but not as a movement disorder itself. Grünewald et al., reported a case of adult-onset subacute sclerosing panencephalitis (SSPE) presenting with left-sided hemimyoclonic jerks with the electroencephalogram (EEG) showing periodic bursts of slow high voltage transients from the right temporal lobe coinciding with the left-sided jerks. Malhotra et al., reported an interesting case of subacute sclerosing panencephalits (SSPE) in a young girl who presented with clusters of partial motor seizures without a cognitive change, followed by periodic hemimyoclonus. Different neurocutaneous syndromes associated with HME are the Proteus syndrome, Klippel–Trenaunay syndrome, epidermal nevus syndrome, hypomelanosis of Ito, neurofibromatosis, and tuberous sclerosis. Bastos et al., described a case of Proteus syndrome with HME and nevus depigmentosus on the face, ipsilateral to the side of HME. 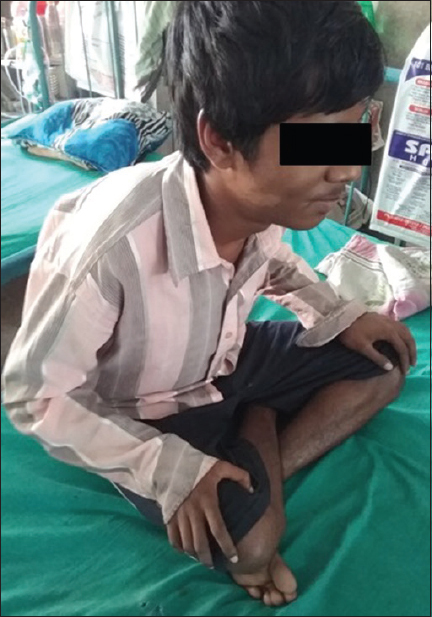 Krishna Kumar et al., reported a case of HME involving the right cheek and right ear along with hypertrophy and seizures. In contrast, in our patient, there was nevus depigmentosus contralateral to the side of HME, that has not been reported previously. We searched for associated limb hypertrophy (Proteus syndrome), varicose veins, port wine stain (Klippel–Trenaunay syndrome), truncal whorled lesions in lines of Blaschko (hypomelanosis of Ito), hemifacial lipoma, brownish linear or warty lesions (epidermal nevus syndrome), adenoma sebaceum, shagreen patch, ash leaf macule (tuberous sclerosis), or any neurofibroma (neurofibromatosis), but these manifestations were absent. We only found exotropia in the right eye (which can be associated with hypomelanosis of Ito) and a bifid distal phalanx of the right little finger (type 1 preaxial polydactyly). HME is the primary etiologic factor of many epilepsy syndromes such as the Otohara syndrome and the West syndrome, and may evolve to the Lennox–Gastaut syndrome, while EPC has been reported as well. 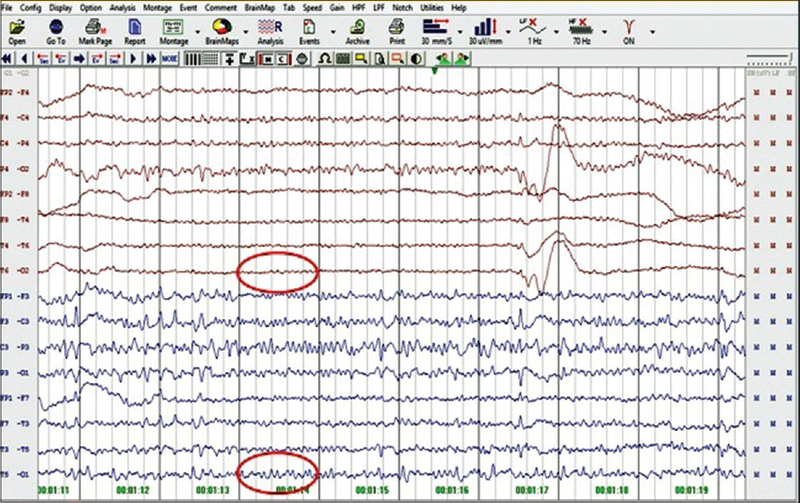 Paladin et al., described the EEG findings in HME as being of three types: (1) triphasic complexes of large amplitude in patients with earliest onset seizures and a severe prognosis; (2) unilateral rhythmic alpha-like activity in patients with seizure onset after 3 months of age and a favorable outcome; and, (3) asymmetrical suppression-bursts characterized by alpha-like activity on the abnormal side. Konkol and Maister, however, did not find any relationship between the type of EEG and the prognosis. 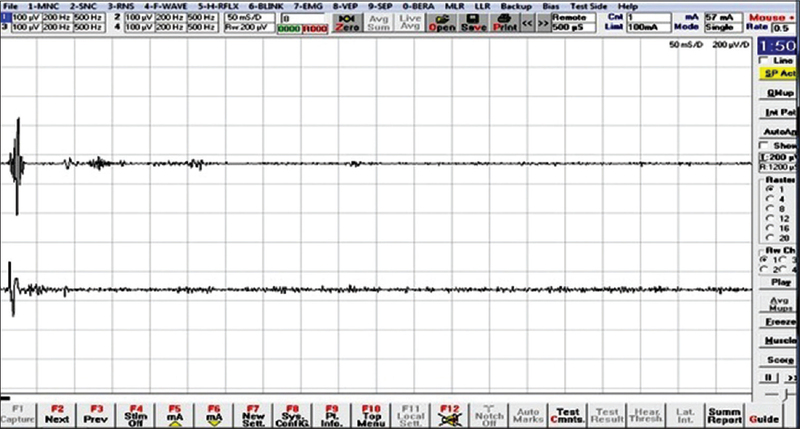 On the first impression, the EEG of our patient appeared to show background attenuation on the right side. However, after finding HME on the left side on MRI, it was concluded that the EEG signals were actually indicating a higher background amplitude from the involved left side, which has been well reported and stressed by Vigevano et al. In our case, jerks were completely absent during sleep and the spikes arising from the left hemisphere were nonperiodic. Hence, the possibility of EPC was very low. Thus, our case demonstrates a unique presentation of HME as an uncommon hyperkinetic movement disorder in the form of hemimyoclonus of cortical origin. We would like to thank the staff of the Department of Neurology, Medical College and Hospital, Kolkata. 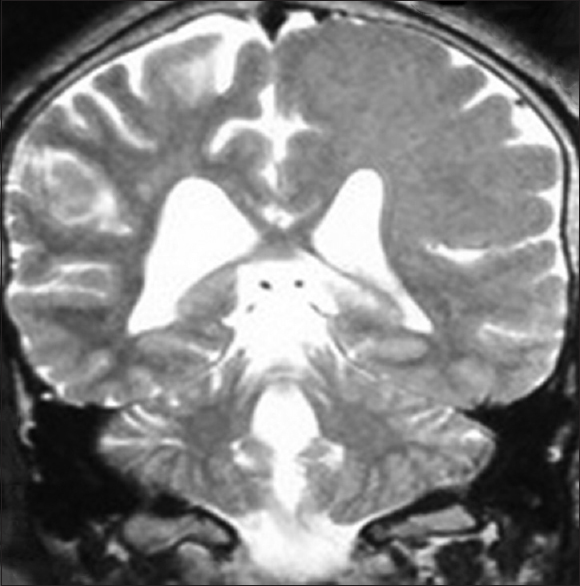 Moreira Filho PF, Freitas MR. Post-anoxic hemi-myoclonic encephalopathy: Report of a case. Arq Neuropsiquiatr 1986;44:67-72. Beudel M, Elting W, Uyttenboogaart M, Broek MW, Tijssen MA. Reticular myoclonus: It really comes from the brainstem. Mov Disord Clin Pract 2014;1:258-60. Grünewald T, Lampe J, Weissbrich B, Reichmann H. A 35-year-old bricklayer with hemimyoclonic jerks. Lancet 1998;351:1926. Malhotra HS, Garg RK, Naphade P. Cluster of partial motor seizures heralding the onset of hemimyoclonic subacute sclerosing panencephalitis. Mov Disord 2012;27:958-9. Flores-Sarnat L. Hemimegalencephaly syndrome. In: Sarnat HB, Curatolo P, editors. Handbook of Clinical Neurology: Malformations of the Nervous System, Vol. 87. 3rd series. Edinburgh, London, NY, Toronto: Elsevier; 2008. p. 153–76. Bastos H, da Silva PF, de Albuquerque MA, Mattos A, Riesgo RS, Winckler MI, et al. Proteus syndrome associated with hemimegalencephaly and Ohtahara syndrome: Report of two cases. Seizure 2008;17:378-82. Kumar KR, Syeda GJ. Hemimegalencephaly: Report of a rare case. Int J Adv Health Sci 2015;2:7-10. Di Rocco C, Battaglia D, Pietrini D, Piastra M, Massimi L. Hemimegalencephaly: Clinical implications and surgical treatment. Childs Nerv Syst 2006;22:852-66. Paladin F, Chiron C, Dulac O, Plouin P, Ponsot G. Electroencephalographs aspects of hemimegalencephaly. Dev Med Child Neurol 1989;31:377-83. Konkol RJ, Maister BH, Wells RG, Sty JR. Hemimegalencephaly: Clinical, EEG, neuroimaging, and IMP-SPECT correlation. Pediatr Neurol 1990;6:414-8. Vigevano F, Fusco L, Granata T, Fariello G, Di Rocco C, Cusmai R. Hemimegalencephaly: Clinical and EEG characteristics. In: Guerrini R, Andermann F, Canapicchi R, Roger J, Zifkin BG, Pfanner P, editors. Dysplasias of Cerebral Cortex and Epilepsy. Philadelphia: Lippincott-Raven; 1996. p. 285-94.